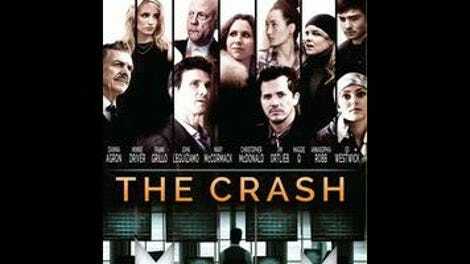 Part rejected network pilot, part Michael Crichton-esque what-if, the clumsy, cheap-looking sort-of thriller The Crash presents a very near future in which the U.S. government secretly enlists a white-collar crook from Chicago named Guy Clifton (Frank Grillo) to put together a team of hackers and analysts who can stop an imminent computer attack on the stock market. Whatever fun one might have with this junky premise is neutralized by the fact that the movie has zero narrative momentum. At once oversimplified and overcomplicated—the type of film where shadowy elites cackle sinisterly while meeting at an abandoned carnival in broad daylight—The Crash fumbles between bad diatribe and bad domestic drama, complete with subplots about absent parents and childhood cancer. Only occasionally does writer-director Aram Rappaport remember that what he’s supposed to be making is a bad techno-thriller, the kind where people shout information at each other over the phone while staring at multiscreen displays of scrolling numbers and code. Rappaport films everything with a whipping, zooming handheld camera, in close-ups with no sense of staging, so disoriented and interchangeable that the whole thing might as well have been shot in one location. (The fact that The Crash was actually filmed in several cities will probably be lost on the majority of viewers; it’s perversely un-scenic.) There are a plenty of problems here, with proportion being the most obvious: too many characters and no impression of scale, time, or action. The running countdown seems like a cruel joke at the expense of the movie’s lack of urgency. Before he found his calling as a weathered, raspy-voiced character actor—usually cast as a cop, a special forces type, or an MMA trainer—Grillo had a brief career on Wall Street, which explains how he came to star in and executive-produce this presumably low-budget project. A sort of latter-day Lance Henriksen, he acquits himself nicely in the role, even though the movie can’t seem to make anything of Guy or any of the other characters. The cast members—which include Minnie Driver as Guy’s wife, John Leguizamo as a computer whiz, and Ed Westwick as a protégé who is also dating Guy’s teenage daughter—all seem to exist in a limbo somewhere outside the narrative; at no point is it clear what any of these people are supposed to be doing, aside from sounding off on events that seem to happen somewhere else, apparently on their own. Any movie about modern financial crime, however simplistic, has to overcome a plot that’s almost completely intangible: It can go big on ego and excess à la The Wolf Of Wall Street or make narrative dislocation and abstraction into central themes, as in Michael Mann’s underappreciated Blackhat. Rappaport seems to be going for something cosmetically similar to the latter; parts of the score even sound like they were written over a temp track of Elliot Goldenthal’s music for Mann’s earlier Public Enemies. If only The Crash were anything like a poor man’s Michael Mann movie. Bluntly obvious, indifferently organized, and unremittingly generic—a hodgepodge of airplane hangars, book-lined living rooms, and downtown street corners—it’s more like a poor man’s version of itself.